Search trends in the closing days of the Scottish Independence referendum show a marked change over the last month. I wrote yesterday about links pointing to official referendum camps yesscotland.net and bettertogether.net as Scotland heads into its most important decision in recent history. Opinion polls are roughly neck and neck depending which paper you read, but I’ve been looking at the underlying data that shows what people are linking to, talking about and searching for on the web. Google Trends is a service which shows what’s hot in the world of search, but also allows you to compare any terms that are being searched for. If we look at the trends for ‘Yes Scotland’ and ‘Better Together’, we can see that, over the past few weeks, searches for the former have not only increased, but dramatically so compared to that of the latter. 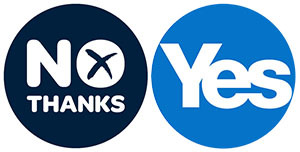 The polls have also shown a surge for the Yes camp in the last week, but even so, if those are the numbers you go by, it’s still too close to call. Google Trends suggests the gap is far greater, as did the data from yesterday’s post, Can big data predict indyref? Is this just an ‘up’ that can be balanced with a corresponding ‘down’ that averages things out? Not if you look at the 12-month graph, which shows searches for each term are fairly consistent. Does this mean Yes will win on the day. No, it certainly doesn’t give us a direct indication that searches mean votes. In fact, it could be argued that the searches could indeed come from the opposite camp just as much as it could come from the supporters. But, just as we would do when analysing search data for a business, we will compare the data with actual events, and correlate them. If the result of the referendum shows something different from what we’re led to believe is a close call, and something closer to the darker, social data emerging on the web, polls will never be the same again. Previous Post: « Can 'big data' predict indyref?